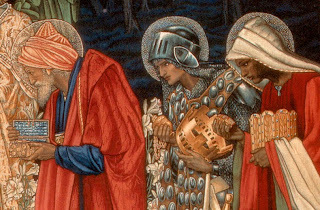 The Epiphany question: Where are you looking for God? This compelling question of life properly stands at the beginning and the end of a new year: where have you found God? Each one of our texts this Sunday reminds us that God is not to be found where the world's princes and powers reside. Each text calls us to rouse the world with the message of "Arise, shine, for your light has come." Many of us try to find God and solve the problems of life by logical, calculating schemes that insure we receive our share. But God is to be found in receiving, not grasping; in giving, not claiming our rights. All of our texts are emphatic: God's ministers and prime ministers, the friends and fools of the world, have a light to shine in the darkness, an illumination from God that can raise the roof of the world's kings and princes, presidents and prime ministers. As we turn over a new year, one thing is sure: more and more people are trying to find a way to God by climbing the ladders of success and power and respectability. In these days of the twenty first century, the pursuit of money and power has become one of the most powerful mystery religions ever to show its face in the history of humanity. This makes it all the more imperative that the Epiphany News is that God is found in incarnation, in the humility of birth in a stable. All our texts remind us that light has come upon the "little ones" to share with the "learned," a light more brilliant than the pillar of cloud by day or the pillar of fire by night, more brilliant than the "thousand points of light" shining in the darkness. Christians are called to offer a ministry of light and a message of illumination to those in power. And what is this message? "Arise, shine, for your light has come." From what direction does it come? Not from economics or the wealth of nations. Not from education or the wisdom of the world. Not from science or technology. Not from star wars notions or war stars nations. The magi point us to where the world's best hope, the world's only salvation comes: bowing before the Christ who is found and served in "the places that stink and where no one loves," St. Theresa's definition of hell. It is absolutely appropriate that our Silent Night should be filled with sound and turmoil. Everything about Christmas is an oxymoron. Christmas celebrates the birth of a little baby boy named Jesus. Yes. Christmas celebrates the coming of the divine messianic king into this world. Yes. It is this combination of opposites that makes Christmas true. I’m struck every year by the timing of this feast, celebrating the Holy Family. It comes on the first Sunday following Christmas, when a lot of us have started to overdose on family. In fact, after the parties and cooking and visiting and obligations and expectations and disappointments, some of us have had about as much “family” as we can take. Parents are wondering when the kids go back to school. A little togetherness goes a long way – for every generation. But then comes this feast. We are challenged to look at what it means to be family. And our eyes turn toward the Christmas crèche, the nativity scene. During this time of year, we tend to sentimentalize the Holy Family – they become figures of plaster and paper, not flesh and blood. But we forget: they weren’t that different from us. They were holy, yes. But they were also human. The story of the Holy Family is the story of life not always turning out the way you expected. It’s the story of a teenage mother, conceiving a child before she was married. It’s the story of an anxious father, confronting scandal, planning on divorce. It’s the story of a family forced to become refugees, living as immigrants in the land that once held their ancestors as slaves. As we heard in today’s gospel, it’s the story of a missing child, and days of anxious searching by his parents. But there is even more. Mark’s Gospel describes an incident in which the relatives of Jesus were so alarmed, they thought he had lost his mind, and set out to seize him. Not long after came his violent death – one his mother watched with helplessness and almost unimaginable sorrow. This family was holy. But it was also human. We need these reminders. Especially now. The Church calendar shows us that the Christmas season is one of light – but also of shadow. The day after Christmas, we celebrate the feast of the first martyr, St. Stephen. Then a couple days later, we mark the feast of the Holy Innocents, the children slaughtered by Herod. The joy of Christ’s birth is suddenly tempered by tragic reminders of what the Incarnation cost. And the Holy Family shared in that. I saw that, vividly, just after Christmas. A parishioner posted on Facebook some images of our Midnight Mass on Christmas Eve. They were beautiful. But I was struck by something that hadn’t occurred to me. In the pictures, I noticed, the light shines brightly on this nativity scene—the Holy Family and baby Jesus. But a few feet away, very close, it shines just as brightly on the crucifix, and the dying Christ. 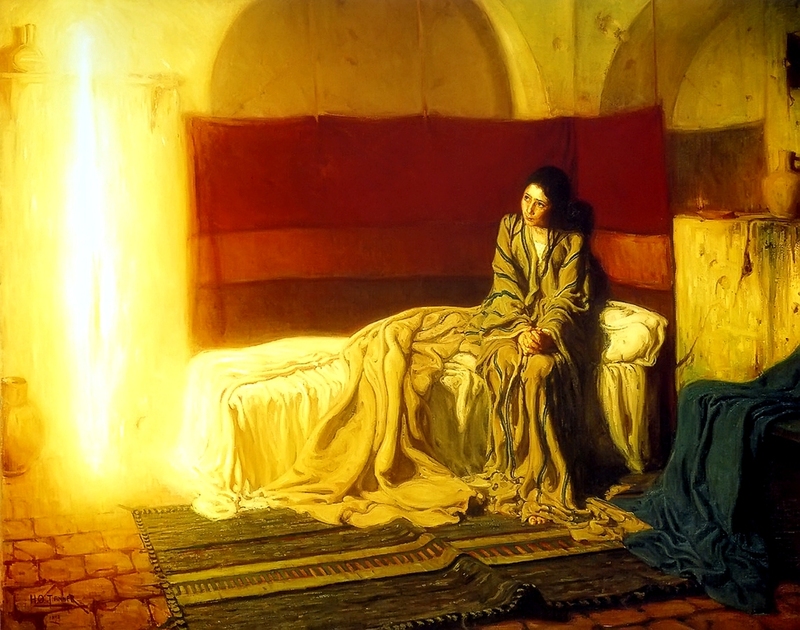 In the stable, the mother Mary looks down at a life beginning; at the foot of the cross, she looks up at a life ending. It is just a few steps here from the wood of the manger to the wood the cross. But in so many ways, the two singular events are inseparable. One led inevitably to the other. Joy and sorrow are almost side by side, linked by sacrifice, by faith, and by love. It is the story of our salvation. And it is the story of the Holy Family. The juxtaposition of those two images in this church, the crèche and the crucifix, serves as a powerful lesson for this feast. We realize that when we speak of the Holy Family, we speak of a family that struggled and suffered, like so many of us. But: this family also knew profound hope. They trusted completely in God. They call all of us to that kind of trust. And they are with us. In our own time, they stand beside all who worry, who struggle, who search, who pray. The Holy Family stands beside parents anxious about their children, worrying for their welfare. They walk with immigrants and refugees separated from those they love. They comfort teenage mothers and single parents. They console the prisoner, the outcast, the bullied, the scorned—and the parents who love them. And they offer solace and compassion to any mother or father grieving over the loss of a child. This Christmas, they weep with the parents of Newtown and Sandy Hook. The Holy Family shares our burdens. But they also uplift us by their example. Jesus, Mary and Joseph were never alone. They endured through the grace of God. They prayed. They hoped. They trusted in God’s will. We might ask ourselves where we can find that kind of peace and purpose in our own families, in our own lives. One answer is in Paul’s beautiful letter to the Colossians. This passage that we hear today is sometimes read at weddings. Like Paul’s Letter to the Corinthians, it speaks eloquently of love. But Paul wasn’t writing about romantic love. This letter is about how to form a healthy and holy Christian community. And from his words, we can draw lessons about how to form a healthy and holy Christian family. Put on compassion, Paul tells us. Kindness. Lowliness. Meekness. Patience. Forgiveness. And love. It is all that simple — and all that difficult. I’m sure the Holy Family had moments when living those virtues seemed hard, or even impossible. But they did things most of us don’t. They listened to angels. They dreamed. And they gave themselves fully to God. They made of their lives a prayer. When we find ourselves overwhelmed, we need to remember where we look today and remember to look toward the crèche. There is our model for living: Jesus, Mary and Joseph. But we need to see them in full, remembering the closeness of the cross. That was their life and it’s ours, too. Yet, through all their hardships, in a time of anxiety and difficulty, persecution and tragedy—a time very much like our own–they showed us how to be people of faith, people of forgiveness, people of love. They show us, in other words, how to be holy. Does your family need some prayers? These beautiful lyrics for Evening Prayer on Holy Family Sunday were written. to pray for families in "whatever way they come to be..." Our families come to be who they are and aren't in more ways than any of us can know or count! Beneath the shadow of your wing. In every way it comes to be. Unfolds the myst'ry of the creche. Are drawn to you as family. Praise to the Holy Trinity. Pope Francis, in his Christmas Day blessing in St. Peter's Square, denounced the "brutal persecution" of religious and ethnic minorities and condemned conflicts in Ukraine, Libya and elsewhere. It was his second "Urbi et Orbi" ("to the city and to the world") message since becoming pope last year, the pontiff also lamented the deadly Taliban attack on a school in Pakistan that killed 149 people, mostly children, and the deaths of thousands due to Ebola in West Africa. "Truly there are so many tears this Christmas," he said. At one point in the address, Francis, 78, departed from his text to lament that so many children "are victims of violence, made objects of trade and trafficking." He urged Ukraine, which is locked in a Moscow-backed separatist conflict, to "overcome tensions and conquer hatred and violence." On the violence in Syria, the pope invoked "the Savior of the world, to look upon our brothers and sisters in Iraq and Syria. "For too long now they have suffered the effects of ongoing conflict, and ... together with those belonging to other ethnic and religious groups, are suffering a brutal persecution," he said. "May Christmas bring them hope, as indeed also to the many displaced persons, exiles and refugees, children, adults and elderly, from this region and from the whole world." 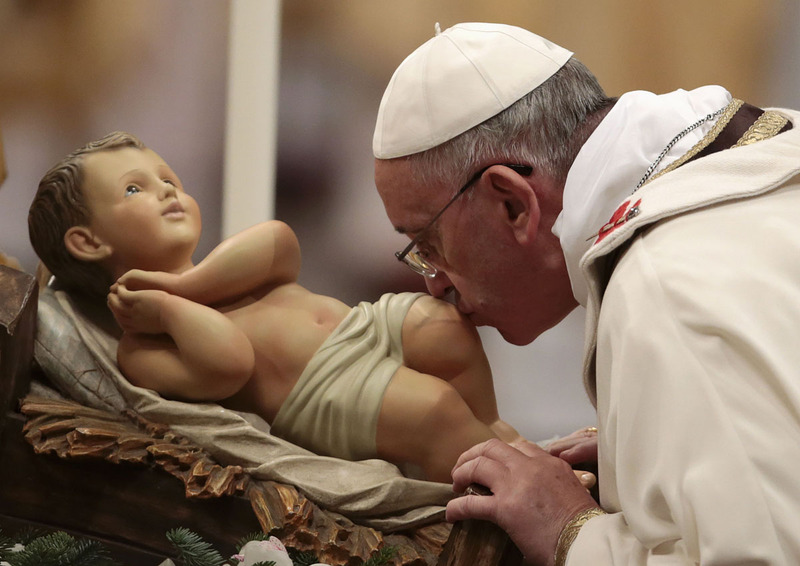 The blessing follows the pope's Christmas Eve Mass in St. Peter's Basilica, but his words were carried on a phone line to Iraqi refugees who had been forced to flee their homes because of an a assault by Islamic State militants in northern Iraq. "You're like Jesus on this night, and I bless you and am close to you," Francis told the refugees, at a camp near the northern Iraqi city of Irbil, according to the audio of the call provided by TV2000. "I embrace you all and wish for you a holy Christmas." "When peaceful stillness compassed everything and the night in its swift course was half spent, Your all-powerful word from heaven's royal throne bounded... And as he alighted... he still reached to heaven, while he stood upon the earth." What a joy it is to be writing to you at Christmastime, when the Word became flesh and dwelt among us! This is the season of Emmanuel, “God with us.” Indeed, God is with us in so many different ways, large and small. He is with us in the Eucharist, in His Real Presence, in His body and blood, in the form of bread and wine. God is with us in the Scriptures, the unfolding story of His steadfast love. God is with us in the family and friends who have stood by us in good times and in bad and whom we remember with such warn affection, especially at Christmastime. God is with us in the forgiveness He offers in the sacrament of Confession, which serves as a towering reminder of the mercy of our God, who loves us dearly, unconditionally. God is with us in the challenges and difficulties of life. As we wrestle with these, God guides us and supports us in countless – and sometimes barely noticeable – ways. But God is there. God is with us even in our darkest moments. Rest assured of that. Of course, God is with us in the good times as well, in the graces that He sends our way, especially during this holy season in which we celebrate His birth. In all the marvelous moments that help us forget our troubles and remember the innocence of our childhood, God is with us. Savor these magic moments of Christmas. Our loving Savior would want nothing less. Emmanuel – God is indeed with us! At the outset of this letter, I remarked that it is indeed a joy to be writing to you at Christmastime. For the past three years, it has been a particular joy of mine to organize college-age retreats for our recent graduates of Chaminade and Kellenberg Memorial High Schools (and their friends). I think that these retreats have been a huge success in the past, both for the spiritual nourishment that they have provided and for the chance to reconnect with old friends. I am happy to announce that our next college-age retreat will be held on January 4 and 5, 2015 at Meribah. The retreat begins with Sunday Mass at 4:00 p.m. on January 4, but Meribah’s doors will be open and a warm fire will be crackling in the fireplace from 2:00 p.m. on, just in case you want to arrive early and catch up with former teachers and old friends. I hope that you can join us for the retreat. You can register by emailing me (SBalletta@chaminade-hs.org) or by visiting my personal Facebook page or the Facebook page for the Province of Meribah. There, you will find a link to register online. I really do hope that you will join us. Our theme is “Men of Faith,” and we hope to explore various dimensions of what it means to be a Catholic man. So, if you know any college-age guys who might enjoy a retreat like this, even if they did not graduate from with Chaminade or Kellenberg, just let me know. I would be happy to have them join us. 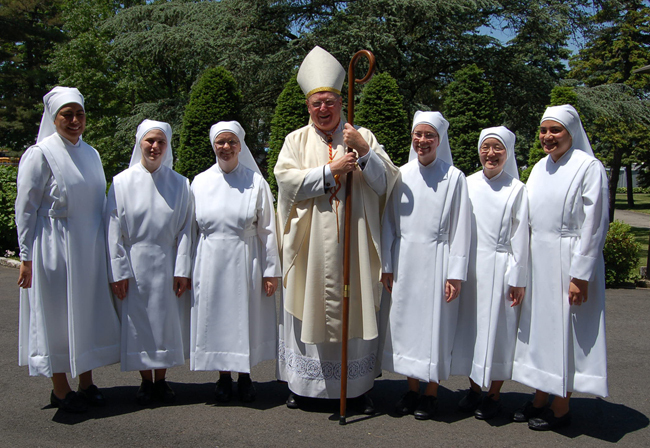 Looking forward to seeing you on the retreat, and wishing you a very Merry Christmas and many blessings throughout the New Year. On behalf of all the Marianists, know that God is with you! The Church puts on our lips a particularly helpful prayer, if we allow the words to penetrate deeply into our hearts and our souls. The prayer is a combination of the words that God put onto Gabriel's lips when he brought the message heaven had been waiting from all eternity to say to Mary and the words that the Holy Spirit inspired Elizabeth to say in the passage from the Gospel: "Hail Mary, full of grace, the Lord is with you. Blessed are you among women and blessed is the fruit of your womb." Today we make those words our own and ask her to pray for us sinners, now, so that we might be full of grace and with the Lord. Mary knows that some of us are not full of grace and maternally pleads with those in this situation to go to her son, which would be good advice for everyone. And she'd remind us that for the Lord Emmanuel to be with us, we need to head toward him who is coming, to embrace him in prayer and have a loving Communion with Him. The Church wants us to grasp this Advent, that the greatest blessings in this world are JESUS and our FAITH IN HIM. These are the gifts we should be longing for this Christmas, because these are the ones that will truly make us happy. Even if we were to receive ALL the material things in the WORLD for Christmas, that would not be as valuable to us as the gift of God and the gift of increased faith in him. Mary cried out in her hymn of praise, “All generations will call her blessed.” And that prophecy came true. We still call her blessed today, for the same reasons, because “the Lord — the blessed fruit of her womb — is with her,” and because of her faith, which is the model for every disciple’s. This Christmas, the Lord is calling us to make these our priorities. The Father who gave us the gift of his Son that first Christmas wants to give us that Son anew this Christmas, to be God-with-us, Emmanuel, but he wants us to ask for him in faith and respond to him in faith, by making the time to be with God in prayer, by saying “let it be done to me according to your word” and allowing the Lord’s words to be fulfilled in us, in every moral decision we make. To bring joy to others this Christmas, we really have to bring them Christ. At Christmas we especially need to remember that. Rejoice! 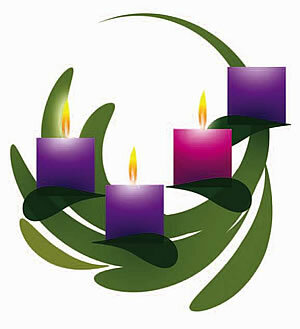 Today is Gaudete Sunday – which means Rejoice Sunday! Rejoice is also at the heart of today’s first reading from Isaiah. So, why aren't we rejoicing? We have this message of joy and hope from God, but we can be distracted by our own sense of isolation. Many things get in the way of our receiving this Good News, including our own sense of unworthiness - who are we to receive that kind of love? But if we can hear what Jesus is saying and wrap ourselves in that loving freedom, then the words of Isaiah, echoed by Jesus, give us a new sense of our own mission - the mission we have as baptized Christians. Now it is our job to not only accept that healing and love but to bring glad tidings to the poor, heal the brokenhearted and proclaim liberty to captives. There is much joy, and these readings bring to the fore that in each case it is an embodied joy, a joy which fills to capacity the human heart and soul. It is a joy which propels Isaiah and the Blessed Mother and John the Baptist and indeed Paul to proclaim God's words. The embodied joy seems to reflect the joy of the baby of Elizabeth who leaps within her at the sound of the voice of the mother of Jesus. Could it be that the Lord is waiting for me? Are you waiting for me, Lord? Is there something you're waiting for me to do? something you're waiting for me to hear? something you're waiting for me to see? something you're waiting for me to say? Is there a truth your waiting for me to discover? faith you're waiting for me to grow in? hope you're waiting for me to trust? Is there someone you're waiting for me to love? 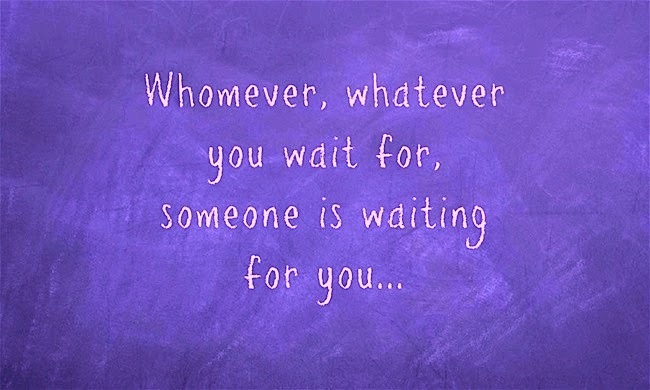 someone you're waiting for me to forgive? someone you're waiting for me to help? Are there favors you're waiting for me to receive? gifts you're waiting for me to use? talent you're waiting for me to share? Have I faults you're waiting for me to acknowledge? sins you're waiting for me to face? pardon you're waiting for me to seek? Is there someone you're waiting for me to let go? a grudge or resentment I need to shake off? habits you're waiting for me to change? Is there a challenge you're waiting for me to accept? a change you're waiting for me to make? a path you're waiting for me to walk? Are there blessings you're waiting for me to receive? truth you're waiting for me to take in? grace you're waiting for me grasp? Are you waiting for me to draw closer to you? in the morning? the evening? on Sundays? As Marianists we have a context for talking about Mary in many different ways and using many different images that situate her within a culture and a moment in time. But how do we as Marianists begin to share who she is for us today, beyond cultural boundaries? One source is Our Lady of Guadalupe, the Patroness of the Americas. On December 12, 1531, ten years after the Spanish conquest of the Aztec Empire, God sent his mother to a Nahua Indian named Juan Diego. This event marks an interruption in history that completely transforms not only one person, but also that of an entire nation. This event sparks the awakening of a new Christianity, local theology and spirituality that still captivates the religious imaginations and hearts of millions throughout the world. It is not just an event of popular religious devotion but also an official feast of the universal Church. The Guadalupe event continues to transform and evangelize five centuries later. The story of this marvelous event centers on Our Lady of Guadalupe appearing to Juan Diego. At the moment when Juan Diego encountered the Mother of God, there are no words exchanged. The heavenly music, singing of birds, and the cosmic symbols that surrounded her beautiful mestizo image engaged Juan Diego in a divine way that was respectful of his Nahua culture. Our Lady of Guadalupe’s indigenous beauty; the manner in which she was poised—standing before the sun and crescent moon, draped with a mantle of sky and stars, and carried by an angel—and her posture depicting her compassion, respect, and God’s love extended communication beyond mere words. The language of Juan Diego’s culture was (and still is today) symbolic. The moment of the first miraculous apparition was one where the Dark Virgin’s symbolic vesture speaks more than any words need be spoken. The Good News of salvation is proclaimed and experienced, respecting the importance of culture at this event. The message of God’s incarnation transcends any cultural limitations and was completely understood by Juan Diego during this encounter. Juanito goes to the first bishop of Mexico, Juan Zumarraga, and is kept waiting, treated with suspicion, and finally told to bring a sign from this heavenly lady. During Juan Diego’s long journey home he finds his uncle, Juan Bernardino, dying of a disease introduced by the conquistadors. This hinders his return to the Lady of Tepeyac for the requested sign. He takes a different route to locate the priest that his dying uncle had requested. 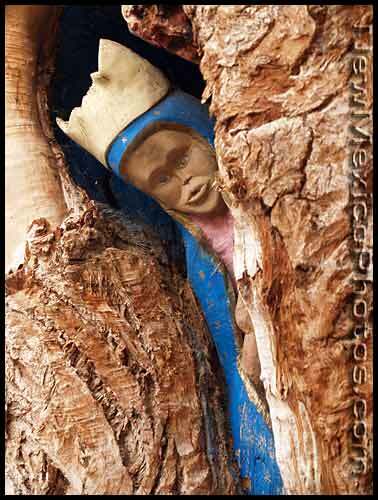 La Virgencita appears along the different route and assures him that his uncle was already healed. Juanito is to return to the top of Tepeyac, pick the flowers of all colors there, and bring them to her. He does as he is told, and La Virgencita arranged the rare flowers on Juan Diego’s maguey cactus fiber cloak—tilma—and sent him to visit the bishop with these flowers that would be the sign. Flower and Song are the two symbols that come together that express harmony, truth, and allow one to communicate with the divine. For the Nahua people, flowers were essential to understanding any truth that is of God. When Juanito unwraps his tilma before the bishop and assistants, the miraculous image of Our Lady of Guadalupe is imprinted on it. His tilma is what is enshrined at the world-renowned basilica in Mexico City, the site that honors The Blessed Mother of God’s request. The Guadalupe event is a tradition of living faith; Mary, the Mother of God, embraces the color and symbols of a particular culture so that she can bring comfort to a people. Buona sera! I wish you a holy and happy Christmas. When we turn on the lights of the creche [sic – he said"Presepio" but meant "albero" (tree)], we want the light of Christ to be in us. A Christmas without light isn't Christmas. So let there be light in our souls, in our hearts; let there be our forgiveness for others; and let there not be hatred, for this are darkness. Let there be the light of Jesus, which is so beautiful. This is my wish for all of you. Many thanks for your gift – it's beautiful. And I give you my warmest tidings of peace and happiness. If you have something dark on your soul, ask the Lord's forgiveness. This is a beautiful chance Christmas gives us – to clean up our souls, eh! Don't be afraid – the priest is merciful, he forgives everything in the name of God, because God forgives everything. May the light be in your hearts, in your families, in your cities. And now, with this wish, let's turn on the lights. May almighty God bless you, the Father, Son and Holy Spirit. Merry Christmas and pray for me! On Sunday, November 30,worshippers at a Mass at Philadelphia’s Cathedral Basilica of Saints Peter and Paul heard for the first time the hymn that will be played at Pope Francis’ Mass during next year’s World Meeting of Families. “Sound the Bell of Holy Freedom” was co-written by Norbertine Father Andrew Ciferni and Normand Gouin and was selected from 20 entries which were submitted by invitation only. The hymn opens with an allusion to Philadelphia’s Liberty Bell, and traces the life of Jesus’ family. Normand Gouin, who composed the musical score,currently serves as Director of Music for Old St. Joseph’s National Shrine in Philadelphia, Pennsylvania. Mr. Gouin has worked full-time in pastoral ministry for the past 17 years. He has served as both Liturgy and Music director in a variety of church settings including St. John’s Student Parish in East Lansing, Michigan the community that serves the Catholic student population of Michigan State University. As a composer, Gouin has been commissioned to write works for both churches and religious communities throughout the country and most recently has worked as the lead composer and editor for the Liturgy of the Hours project, a joint effort between St. Norbert’s Abbey in DePere, Wisconsin and Daylesford Abbey in Paoli, Pennsylvania. He has works published by MorningStar Music Publishers and GIA publications and has been a contributing writer for the GIA Quarterly. Mr. Gouin has served on several Diocesan Liturgical Commissions and locally has worked as a consultant with the Philadelphia Liturgical Institute. He holds degrees in music and liturgical studies from The Catholic University of America and the University of Notre Dame.